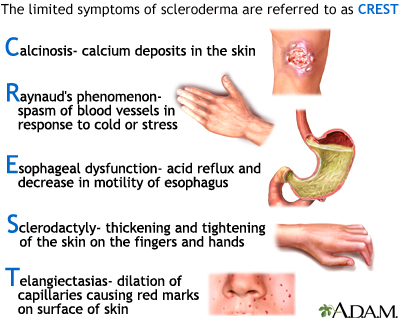 The symptoms involved in CREST syndrome are associated with the generalized form of the disease Systemic sclerosis (scleroderma). CREST is an acronym for the clinical features that are seen in a patient with this disease. The “C” stands for calcinosis, where calcium deposits form under the skin on the fingers or other areas of the body. The “R”, stands for Raynaud’s phenomenon, spasm of blood vessels in the fingers or toes in response to cold or stress. The “E” represents esophageal dysmotility, which can cause difficulty in swallowing. The “S” is for sclerodactyly, tightening of the skin causing the fingers to bend. Finally, the letter “T” is for telangiectasia, dilated vessels on the skin of the fingers, face, or inside of the mouth. Usually only 2 of the 5 symptoms of the CREST syndrome is necessary to be diagnosed with the disease .